The Seattle Mariners never-ending battle with injuries to their starting rotation continues to be just that, never-ending. The latest victim, once again, is longtime ace Felix Hernandez. 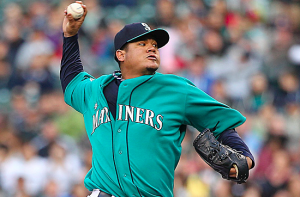 The Mariners placed King Felix on the 10-day DL Saturday with biceps tendinitis. It’s the second trip to the DL for Hernandez this season. He previously missed nearly two months of action with shoulder inflammation. Hernandez has not been quite as dominant as we’re accustomed to seeing him this season. In 13 starts he’s 5-4 with a 4.28 ERA. However, he’s started to show some improvement since coming back from his last stint on the DL. In six starts during the month of July, Hernandez was 2-2 with a 3.86 ERA. During that span, he held opposing batters to a .206 average and averaged better than a strikeout per inning. Moreover, the Mariners just need their starting pitchers to remain healthy. They went two months earlier this season without Hernandez and won’t have the services of Drew Smyly at any point this season. Seattle was also forced to survive a stretch without James Paxton and is still waiting for Hisashi Iwakuma to return from the DL. Taking the place of Hernandez for the time being will be Marco Gonzales. The Mariners acquired Gonzales in a trade with the St. Louis Cardinals last month. The 25-year old lefty is set to make his Mariners debut on Saturday against the Royals. Gonzales made one start for the Cardinals earlier this year, but gave up five runs and lasted just 3.1 innings. However, the young southpaw has been effective at triple-A this season and appears ready for another chance in the majors. Gonzalez will become the 15th different starting pitcher the Mariners have used this season, the most in the majors. He will also become the 34th pitcher Seattle has used, adding to their franchise record. Those numbers showcase just how much injuries to their pitching staff have held back the Mariners this season. Despite the steady stream of injuries to members of their pitching staff, including several of their most important pitchers, the Mariners remain very much in contention for a playoff spot. Seattle began Saturday just 1.5 games out of the second wild-card spot. Of course, the Yankees, Rays, and Royals are all ahead of them in the wild-card standings, with the Angels, Orioles, and Twins still lurking behind them. The Mariners are yet to comment on how serious Hernandez’s injury may be. A minor case of biceps tendinitis may allow him to return as early as next weeekend. However, it’s also possible that he’ll end up missing most of August, possibly longer. Even before Hernandez went to the DL, the Mariners were said to be looking to acquire a starting pitcher who has cleared waivers. The loss of Hernandez may force Seattle GM Jerry Dipoto to pull the trigger on a trade that adds depth to the team’s rotation. Seattle has done well to survive to this point of the season considering the rash of injuries to its starting rotation. But losing Hernandez to another DL stint could take a lot of the wind out of their sails in the middle of the playoff chase. Whether Hernandez is quick to return from the DL or not, the Mariners need to find a way to bolster their starting rotation. The injuries they’ve suffered this season could be too much to overcome.